For this month’s spotlight, we are highlighting a student who participated in our Community Health Internship Program (CHIP) and currently serves as the South Central Regional Representative on the AHEC Alumni Board. Learn more about Logan Stiegman’s involvement with AHEC and his plans for the future. What school are you attending/did you attend? 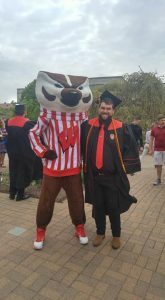 I am recently graduated from the University of Wisconsin-Madison and studied Genetics and Plant Pathology. Where do you work/what is your profession? I work as a Pharmacy Lab Technician at Hoey Apothecary. What are your hobbies, interests, or activities? I love watching movies, baking, and spending time with friends and family. How were you affected by your participation in an AHEC program? I loved my time in CHIP and grew a lot both personally and professionally! I gained valuable skills in working with people different than myself and communicating effectively. Why did you decide to serve on the AHEC Alumni board of directors? I enjoyed my time with AHEC and wanted to continue my involvement and help make decisions that will impact fellow alumni! What’s something you hope to accomplish or impact during your term? I hope to help plan programming that is exciting and interesting for our alumni and create opportunities for networking and collaboration. What would you like other AHEC Alumni members to know about the AHEC Alumni association? The Alumni association is a fabulous place to connect with others that share your passions and can help you learn and grow in your professional field! What are your future plans? How do you want to impact the health or Wisconsin? I am currently exploring further schooling for a clinical profession. I am excited to continue to learn more and use my knowledge to work towards better health equity for minorities and disadvantaged groups in Wisconsin.